Planning a kitchen project is always an exciting occasion, but it is rarely a simple one – especially if it’s your first time. There is a lot of conflicting kitchen design advice available on the internet and it can be difficult to know how exactly you should tackle your kitchen project. In this article, the Extreme Design team of specialists share some free interior design advice formed from their experiencing designing some of the UK’s most exciting luxury kitchen designs to help you get started in designing your very own opulent kitchen. There are so many options available when designing a kitchen, particularly when you are opting for a luxury handcrafted, bespoke kitchen as the possibilities truly are limitless. Gather inspiration from Pinterest, magazines and online research to show your designer the styles that catch your eye. Also, think about the appliances that you may require, this article by our designers offers advice on how to choose which appliances are best for you. All of these ideas will form a wish list for you to share with your designer, it is then their role to create a design that captures all of your wishes. Whether a home is newly built or renovated, the most successful projects have a scheme that works harmoniously throughout every aspect of the property, from the exterior architecture and landscaping to the interior design scheme and joinery. Although we are not architects at Extreme Design, architecture plays a core role in our designs and we’ve explored how architecture can impact your kitchen design in this article. Whether you opt to align your interior to your architectural style, or create a bold contrast, it is a decision that should be made early on as it will set the tone for your design and influence each of the decisions made as your kitchen design is developed. 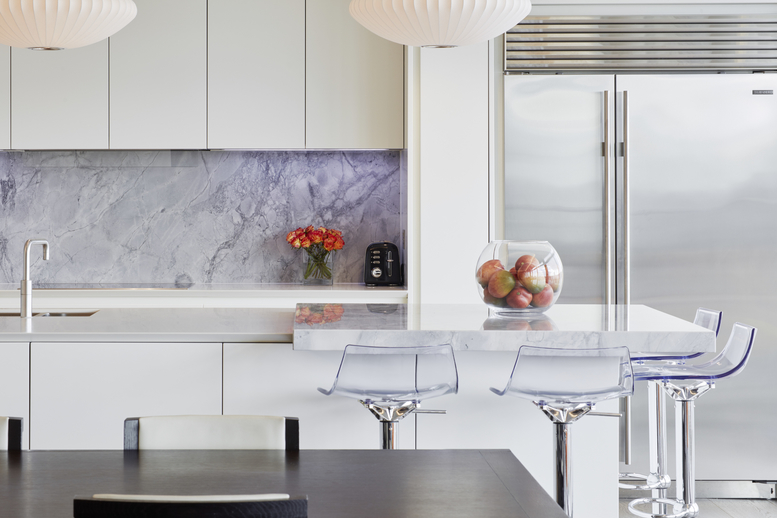 A luxurious kitchen project can quickly snowball if you don’t have a budget set from the beginning. The most beautiful and innovative kitchens do, of course, require you to spend a little more than average, but that doesn’t mean you shouldn’t set limitations. Many people think that the financial elements are to be discussed towards the end of the design journey, however the financial parameters of your project form part of your wish list along with style, functionality and lifestyle requirements. In the famous words of Coco Chanel, “fashion fades, only style remains the same.” Your kitchen is the heart of the home and should reflect who you are wholeheartedly. While leafing through an interiors magazine or attending any one of the year’s beautiful design shows is certainly a great way to be inspired, it should not serve as the entire foundation for your project. When planning your kitchen project, allow your imagination to soar and incorporate elements that you personally love. Do your best not to be swayed by what’s currently in vogue; trends are constantly shifting, but your individuality and personal style is timeless. Lighting has the ability to transform a room and bring a design to life; nowhere is this more important than in a luxury kitchen. Even in the most opulent and expansive homes, open-plan living plays a vital role in the interior layout so being able to create different zones within your kitchen, through a combination of integrated and accessory lighting, is a must. You should also ensure that you have the ability to adjust the mood of the lighting to suit a range of occasions from breakfast with the family, to an elegant cocktail evening. The exact colour temperature of your lighting is an element that many people overlook, however it plays a vital role in the overall aesthetic of your space. Lighting a beautifully crafted luxury kitchen in harsh blue light will cheapen the appearance of even the most striking kitchen designs, so your lighting scheme including colour temperature, luminescence, placement and mood lighting options, should all be designed alongside your kitchen design. Deciding your lighting upfront also minimises the risk of disruptive, costly and time-consuming changes at a later date. Kitchen design projects are almost always one of the largest investments within your home and luxury, expertly crafted kitchens have the durability to last for decades. Therefore, it is important that the features, layout and functionality of your kitchen will evolve as your lifestyle evolves. yet to have a family, your design should accommodate any children that come along in the future. Much like your lighting, the position of services including plumbing, gas and electrics, must be decided early on and planned to suit your kitchen design. Choose to work with kitchen designers that will produce technical drawings for your builders and engage them early so that they can release these drawings to your builders before the services are installed. Changing the position of plumbing, gas and electrics once in place will carry additional costs, so it’s certainly worth having this in place from the very beginning. The balance between form and function is so important when it comes to the design of any kitchen, particularly a luxury kitchen for an iconic residence when design statements become essential. The importance of storage or perhaps more precisely, well-planned storage, simply cannot be understated. Aesthetically beautiful design is, indeed, important but the function of your kitchen should be of top priority (as we have previously discussed). Having well-designed space to store pots, pans and non-perishables makes living and cooking in any kitchen a joy. The flooring you choose to install in your kitchen has a significant impact on the entire feel of the room. Your flooring is also likely to extend beyond the kitchen into other adjoining rooms, so the choice of flooring has a large impact on you entire interior scheme. From materials to colour, there are certainly a variety of exquisite flooring options to help take your kitchen to the height of perfection as we explored in this article. Whether stone, wood, tile or a more intriguing medium, decide on it early so that your designer can create a kitchen that works in harmony with it. Stone may call for a warmer overall design (and underfloor heating), while wooden flooring is frequently a harbinger of an all-encompassing rustic feel. Whatever the case may be, your flooring should definitely be decided early on alongside your interior design scheme and kitchen design; your designer will assist you with creating a complementary palette. Perhaps the most important piece of kitchen design advice one can receive is to work with reputable specialists. From builders to plumbers to carpenters and designers, the team you choose for your project have the ability to make or break your project. Seek recommendations from others who have recently completed their own project and perform your own detailed research. You could even visit the open days of local show homes that are a similar specification to your home and, if you like the look and quality of the work, you can ask the estate agent to give you the names of the specialists involved in the project. You can also ask to see the portfolio of projects completed by a company to gain an understanding of the quality, style and level of their work. It is true that a builder or architect may be able to assist with the rough outline of your kitchen while your imagination runs wild. However, a specialist designer can take your kitchen design to a new level and create a space that is truly unique and personal to you. A designer from Extreme, for instance, will help to weave your very personality into the kitchen through the use of a range of unique design concepts, materials and details. Designers specialising in luxury homes have contacts outside of the standard range of what is available ‘off the shelf’, making the kitchen far more personal to you. At Extreme, we guarantee that our designers will help you to craft a unique kitchen that is truly like no other. To begin your kitchen project with the help of an expert designer, don’t hesitate to contact one of our design studios today.